Online registration for the 2019 Cache Gran Fondo is now open. We welcome all past and future attendees to register early for the best pricing, please check your e-mail for special promotion for returning riders, (you may have to check your spam or promotions folders in Gmail). The Cache Gran Fondo is an annual Italian-style ride in Cache Valley in Northern Utah. The Cache Gran Fondo occurs on the 2nd Saturday of every July and riders can ride either on a 38 mile, 50 mile, 70 mile or 100+ mile route. As one of the fastest-growing and largest rides in Utah, our focus has always been to create a fun, rewarding and challenging event. Our riders enjoy well-stocked support stations, chances to win great prizes, enjoy a great breakfast and lunch, receive big-blingy finisher medals, and have a fun day riding with 1000+ other inspiring cyclists. Race teams, corporate teams, families & neighborhood groups, couples and individuals all converge in Cache Valley for this big, fun, ride. Every year we also offer a limited-edition cycling jersey for only $40. Below is an example of the 2019 jersey. For more information, visit our STORE page and to view sizing charts and information about our 2019 Jersey supplier HyperThreads. Jerseys can be added at registration as well. As part of the UCI Gran Fondo World Championships, we are offering another way for our riders to race for a chance to represent their country at the World Championships. Our ITT will be held on Friday evening and the course will be no more than 11 miles. We will start each rider at 30 second increments, professional timing will be provided, and prizes will be awarded late that evening. For the Time Trial, we are proposing the road-use permit cover from 4:00pm to 6:30pm, with the maximum number of participants at 350. Riders can avoid being omitted by pre-registering online. Proposed course description is below and we are requesting to permit the first 5 miles of beautiful Logan Canyon. The road has a mostly wide-shoulder, and on most evenings there is a slight thermal that blows UP the canyon. The proposed Start/Finish and awards ceremony, will be held at the park at 1st Dam. The Logan Race Club is the official club and sponsor for the time trial event. Prior to the 2019 Cache Gran Fondo on Saturday morning, riders will be offered a complimentary breakfast, courtesy of our title sponsors, Intermountain Logan Regional Hospital and Intermountain Orthopedics and Sports Medicine. This healthy breakfast is available from 6:00 to 6:45 a.m. at the start line. Come a bit early and get fueled up for the big ride, and there will also be items you can take with you. All riders need to be ready to ride by 6:20 a.m. on Saturday, July 13, from Logan Regional Hospital's southwest parking lot located at 500 East, 1400 North, in Logan, Utah. Riders can choose from either a 38 mile, 50 mile, 70 mile or 112-mile course through Cache Valley. The finish line for all distances is located in downtown Logan on 100 North between 100 West and Main Street (NOTE: Finish line is one block north of the 2012-2014 rides). Logan City closes the entire street for the event. NOTE: If we have interest and enough to field a group, we will open a 70+ category and run the 70+ race group on the 70-mile course. * Note: ALL 1st, 2nd and 3rd place finishers on the 112-mile course and KOM/QOM will receive a official UCI Gran Fondo World Series jersey, and special winners medal. To see a birds-eye view of the route, click here to see it on Relive. In 2017, we had to reverse the route due to some spring flooding that damaged several roads - and the feedback was very positive on the new coarse. In 2018 & 2019, we kept the 2017 route, starting with pilot cars from Logan Regional Hospital on 400 East to 2500 N, crossing US91 and leaving the city via Airport road. The ride will continue through Benson, past Benson Marina and turn north onto Highway 23. Newton will serve as your two support stations (at 17 and 37 miles). Finish line will be the same on 100 North in downtown Logan, Utah. Our 70-mile course will add an additional loop to the 50-mile course, and send riders through Trenton, to Lewiston north and then back south to Newton. The loop will be a very flat and open course through the farm-lands of northern Cache Valley. Based on early registration numbers, this new route was very popular in 2018, and we anticipate even more riders in 2019. The 113-Mile GF CHALLENGE Course. Weston Canyon Clockwise Course. After completing your desired distance, all participants are invited to participate in the Cache Gran Fondo's Gran Feed and Outdoor Expo sponsored by the Logan Downtown Alliance. The Gran Feed will be held on 100 North between Main Street and 100 West. Logan City will close the entire street for Saturday and welcome the Gran Fondo riders to eat, meet local vendors, win prizes as part of the ride, listen to local bands and enjoy a great summer evening in downtown Logan. There will be activities for people of all ages. Additionally, thousands of community members will be mingling as part of the Downtown Logan Farmers Market adjacent to the finish area, & this weekend also marks the opening of the Cache Valley Opera season. Last year (2018) the Cache Valley Mountain Bike Team provided a Bike Valet to all our riders at the finish line, so you can check your bike in, enjoy the expo and your lunch, and have your bike watched over in a secure area. We pay for their set-up, but it is a fundraiser for the club so please bring a few extra dollar to tip the valets for the service. Each year we hire a professional photographer who works very hard to capture our riders at the start line, on the course and at the finish line. ALL PHOTOS are free-of-charge to our riders, and as you can see from the photo gallery link below, there are hundreds of great images for you to download, share and keep as a reminder of your time at the Cache Gran Fondo. Free to view, download and share. PHOTOS by Gary Bird Photography. Gary can also professionally print them for a small fee. As always, you can 1 click to download all to your computer or individually. There are plenty of places to park at both the start and finish line, but there are also a lot of free public parking between the start and finishh line. 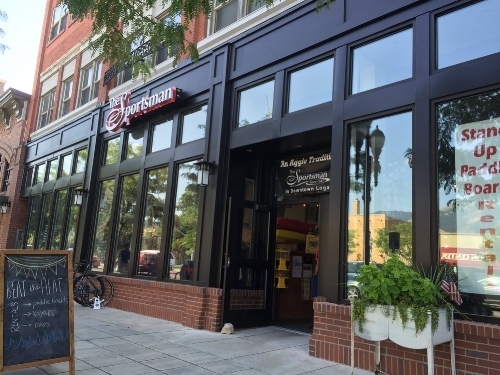 Many riders like to park in downtown Logan, around the 400 North area, or the mall parking lot and then ride to the hospital so they don't have to get back on the bike after the ride. Many options are available. Please note that the finish line is about 12 blocks away from the start line. Please enter parking areas by driving east until you get to 600 East. 400 East will be closed off to vehicles on race day morning, please enter from 600 east. Finish line parking. Please note; NO PARKING in the red section behind Needham Jewelers, Even Steven's, and the Sportsman. This are will be used for exhibitor booth, tables and chairs, and food vendors (your lunch!). ALL riders are eligible to win many different prizes, in addition to the race category prizes. The set of rider prizes is still being finalized, but we will have bike jerseys and many different camping items from CampChef, gift cards and great rider gifts from Al's Sporting Goods, a cycling items from The Sportsman and Joyride Bikes, and Malouf Sleep products ( a fan favorite in 2018!). A tradition at Cache Gran Fondo is EVERYBODY is eligible to win regardless of their finish time, (but we also throw prizes at the winners too!). Many riders will walk away with great prizes in addition to the finisher gifts. Some examples are; Oldest and youngest riders, farthest distance travelled, at least one person from each state/country represented will be prized, ‘sweeper’ awards for the slower finishers, Coolest Jersey, Coolest Bike, Most Inspirational, and over 20 ‘courtesy’ awards for riders who make other rider’s experiences better and more safe and enjoyable, (Ride Respect Awards). Riders must ride no more than two abreast. Ride two abreast only if the shoulder is wide enough. Ride on the right shoulder of the road, AND NEVER CROSS THE YELLOW CENTER LINE. Keep your bike equipped with two water bottles, spare tubes, and basic repair equipment. Although we will have bike mechanics throughout the course, you are responsible for repairing your tire and bike should you experience mechanical errors. don’t forget, breakfast is complimentary every day in the lobby. If you prefer to bring your camper or tent, there are dozens of nearby options. Refer to this list of campgrounds in the Logan area. If this is your first time riding 100-miles, you may be wondering how to train for this event. 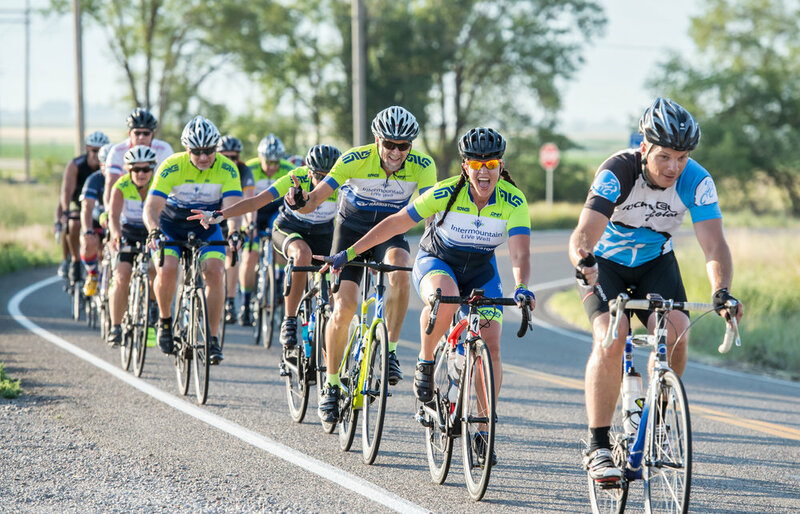 We found this training schedule particularly helpful for new riders who are taking on the Cache Gran Fondo 100-mile challenge. We understand that events can happen that prevent you from riding with us on July 13th after registering for the event. We are happy to help you transfer your registration to a different rider, or defer your ride until 2020 for a $10 fee. Will there be a photographer on the course? We will hire several photographers to document the 2019 ride, as we have for the 2013-2018 rides All photos from the ride will be provided for you free of charge. It's one way we want to thank you for your support and for riding with us. See this link below or CLICK HERE so view the 1000+ images from 2017, the gallery has nearly 1 million views! Can a family member or friend pick up my packet for me? We are sorry, but our insurance with USA Cycling requires a photo ID and wet-ink signature on all waivers. We also need you to verify your emergency contact name and phone number. Where do the proceeds of the event go? The Cache Gran Fondo was originally established as an event to fund special cancer screenings for uninsured women in the area. 5 years ago, the event was assumed by Headspin events, a for-profit event company. Headspin Events (HSpin Events Llc), is committed to growing and improving the event, and since 2013, proceeds of the event have been re-invested to grow and support the event. Each year we match rider donations to cancer services in Cache Valley, and we also support and sponsor other great local charities & events like Common Ground, Bike Utah, The Family Place, Cache Valley Mountain Bike team, local boy scout groups, youth sports clubs and others. If you need to update your registration information, please let us know by contacting us here. How many riders do you expect on the ride this year? We expect to see 1500 riders ride the Cache Gran Fondo in 2019, for example in 2018 we had 1300 registered riders releasing in 6 waves from the start line. This year we will add more waves for the UCI Gran Fondo World Championship qualifier on our 112-mile course. 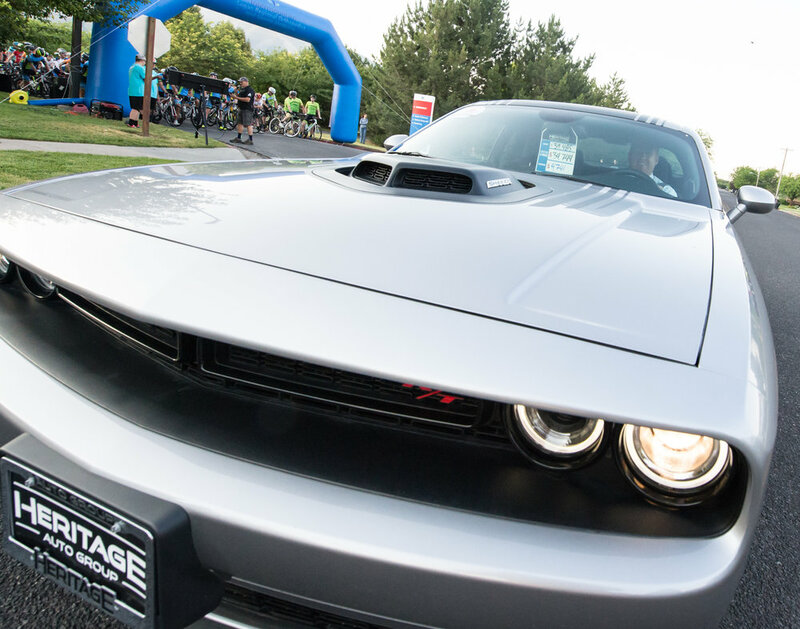 As in the past, in order to spread out that many riders, we will be releasing riders in waives based on categories, and our pilot car company, Heritage Dodge will be showing off some of their new models as our pace/pilot cars and trucks. Is there a lottery to get into the ride? There is currently no lottery system to get into the ride. We will be accepting all registrations we receive between now and ride day. What is available at the aid stations? Aid stations will be stocked with the minimum of water, Gatorade and Pepsi products and supplements, fresh fruit, and quick-grab snacks. We will also have muffins, granola bars, candy, and other food at many stations. Who do I contact for lost/found items? We will have a lost/found booth at the finish line where items can be claimed, or contact the race director at oldhamtroy@gmail.com. Items that aren't claimed by 5 p.m. on July 15th, 2019 will be donated to Deseret Industries the following week. How late will the expo be open? The Gran Feed is scheduled to go until 3:30 p.m. on Saturday, July 13th.